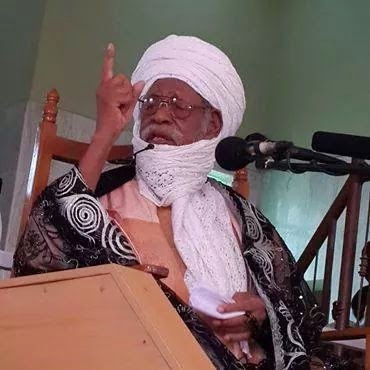 The famous Muslim cleric and a principal figure in the Tijjaniyya sect, Sheikh Dahiru Usman Bauchi has called on the federal government not to give the Igbo’s the biafra nation, rather sit them on the same table along other ethnic nationalities to chart ways out for the economic prospect and peaceful coexistence of a united Nigeria. Speaking to newsmen in Kano, yesterday, Sheikh Bauchi said the strength in Nigeria’s nationhood gave it edge over other smaller African nations, with its huge population making it haven for investors and partner to every nation of the world in-terms of economic benefit and social cohesion. According to him,those agitating for the biafra nation weren’t born when the civil war took place and neither of them can tell what would be the gain if another civil war breaks out in a nation of over a 150 million human population. He explained that Nigeria’s prosperity will be possible when both parties sit on the same table of nation building with each party doing what suits his culture, tradition and religion. “Let’s avoid the situation where people of different religion and cultural belief system eats from the same pot, as it will discriminate against another considering that each came from entirely different background and choices, saying such a practice was the bane of all the agitations,” he said. “I dream of a Nigeria where all sit down on the same table and eat from what is before him; for the Hausa/Fulani to drink his forage and eat ram/sheep meat, Igbo’s or any tribe of the Christians belief to drink his wine and eat pig or dog meats, not to cook all in the same pot and serve all plates. That’s unworkable!”, Bauchi said. He, however,called on the Shi’ite sect to desist from confrontational approach when exercising their religious freedom which caused the recent death of their members and the continued detention of their leader, Malam Ibrahim El-Zakzaky. Dahiru Bauchi urged the security agency responsible for the detention of El-Zakzaky to release the Shi’ite leader.